After being an iPad mini fan for years, Jason Snell is now leaning towards the iPad Air 2. Here's why. I was an iPad mini lover from the first. I bought the original model just so I could try it out, figuring I’d hand it down to a family member or sell it, and ended up adopting it as my own personal iPad. When the iPad mini 2 came out, I rushed to get one and adopted it as my own personal Retina iPad. But a funny thing happened: This summer I bought a refurbished iPad Air 2 in order to try out Split View multitasking, a special feature of iOS 9 that no other iPad supported at the time. (The new iPad mini 4 also supports it, as will the forthcoming iPad Pro.) I spent the summer mostly using the iPad Air 2. So when the iPad mini 4 was announced, I responded by... not buying it. Instead, I’m planning on handing my iPad mini 2 down to my son and sticking with the iPad Air 2. A tale of two iPads. When the iPad Air came out, though, I could’ve jumped back to the full-sized iPad line, since it was so dramatically lighter than the previous full-sized iPad models. But I didn’t, because the iPad mini 2 managed to be just as small and light as the original mini, but packed in exactly the same number of pixels as the iPad Air, and a processor that was clocked only slightly lower than the one on the Air. Essentially the iPad Air and the iPad mini 2 were the same iPad—why wouldn’t I want the same iPad, but lighter and smaller? So I got an iPad mini 2. Behold! The iPad mini 2, with Retina display. Then came the dark days for the iPad mini. In the fall of 2014, the iPad Air 2 was released, with double the RAM of the previous model and the fastest processor ever put into an iOS device. As for the iPad mini, it... well, it says here that it added a Touch ID sensor, and that’s all. Can that be right? I guess you can’t argue with Apple’s tech-specs page. The iPad mini was put on hold for a year, and as a result, the iPad Air 2 got the upgrade that would allow it to run Split View multitasking the following summer. That’s what prompted me to buy one, but while Split View is a nice feature, it’s not the reason that I’m probably sticking with the iPad Air 2. First, as someone who used the first few iPad models a lot, but has been using iPad minis and not iPad Airs for the last three years, I’ve always written the iPad Air off as too big and too heavy. And yes, it is bigger and heavier than the iPad mini. But the difference between the two models now is much less than it was before the full-sized iPad slimmed down. The iPad Air 2 isn’t tiny, but it’s small enough. When stacked on top of one another, you can easily compare the size difference between the Air and the mini. Second, the screen itself is spectacular. Not only is it huge compared to the iPad mini, but it’s got bright colors. All of those pixels on the mini have more room to spread out, which makes it great for comics—all the details that were impossibly small on the iPad mini are quite visible on the iPad Air 2. And third, it’s the speed. 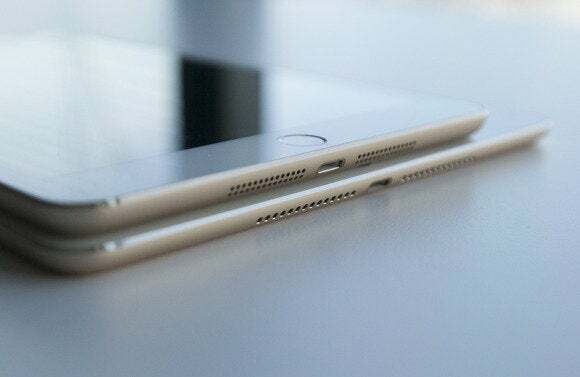 Not only is the iPad Air 2 insanely fast—even a year later, with the release of the A9-powered iPhone 6s and 6s Plus, its speed is impressive, thanks to its extra processor core. The onboard 2GB of RAM also mean that switching between apps is fluid and I don’t have to wait nearly as often for apps to re-load after being killed in the background due to a memory shortage. So, hooray iPad Air 2! And yet... I did say I’m probably sticking with the iPad Air 2, didn’t I? That equivocation seemed suspicious. But if last year was a dark time for the iPad mini, this year is the equivalent for the iPad Air 2. The iPad mini 4 is close to a match for the iPad Air 2 in terms of screen and speed, and it’s still got all of the small-size benefits that the iPad mini line has been offering all along. I’m writing this column on my birthday. My forty-fifth birthday, to be precise. And that means that my eyes, which have quite frankly been loafing on the job since I got glasses when I was 16, are not going to be getting any better. I’m perilously close to needing reading glasses and/or bifocals. After a year of imbalance, right now the iPad Air 2 and the iPad mini 4 are more or the same device. A choice of size is wonderful. But after a summer with the iPad Air 2, I think I’m going to stick with the Air. Sorry, little guy.